Back in 2003 Chase Media founder, Paul Chase, co-produced the UK's first spot attribution tool in association with DDS (now MediaOcean). This was the first time that response data had been attributed to TV airtime in a way that was completely automated. It heralded the development of similar systems such as Adalyser and TV Squared, which add sophistication and have begun to more accurately reflect today's attribution challenges. We have taken this insight and built on it. More critically, we understand what sits behind such tools, giving us a unique ability to interpret the analysis produced. It'll never be possible to understand 100% of what TV is doing for your brand, because so much of it is emotional and long-term, but we constantly strive to get close. TV spot attribution is often hailed as the silver bullet for TV analysis. 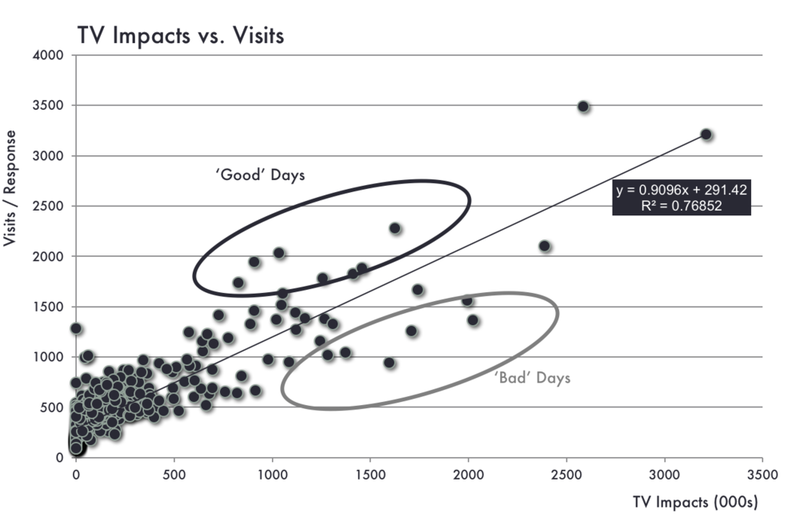 Response data is compared to TV airtime based on the time that spots air and responses are received. A 'response window' (usually 5 minutes) is established, meaning that the uplift in response in the 5 minutes following the airing of a TV spot is attributed to that spot. Most modern attribution tools also profess to measure conversion, whether immediate or up 30 days later, by using cookies. The response window can be altered and other variables can be refined to tailor the model to each advertiser's specific requirements. In theory, when response is attributed it is possible to assign a cost per response down to a spot level. This then enables the advertiser to establish ROI on each TV station used, even without direct tracking via other, more traditional means (promo codes, unique phone numbers, SMS etc.). However, there are certain limitations to these tools, so they're not right for all advertisers or for all types of campaign. They key, as with all analysis, is to understand the limitations of the data and interpret the results accordingly. At Chase Media our deep understanding of attribution (pros and cons) enables us to make informed decisions for our clients. Correlation analysis is more about trend spotting. Unlike attribution analysis, we can't be precise about what reach spot or TV station has achieved. Instead, we aim to understand the relationship between TV viewing and overall response on a broader/long-term basis. This is useful for very densely packed schedules, where attribution is less reliable. TV and response data is essentially aggregated by time interval (for example day or clock hour) then plotted as a scatter diagram. Each data point (in the example below) is one day. The R squared value is a measure of correlation. This can also be thought of as a measure of the reliability of the data. An R squared value of 1 means perfect linear correlation, in other words we would know exactly how many responses we'd get if we bought "X" TV impacts. A value of 0 means the data is random! Our knowledge of these methods give our clients confidence in TV advertising, empowering them to make objective decisions about their ad spend. This bigger picture approach seperates us from many other agencies who just buy media. We take a "what next?" approach.